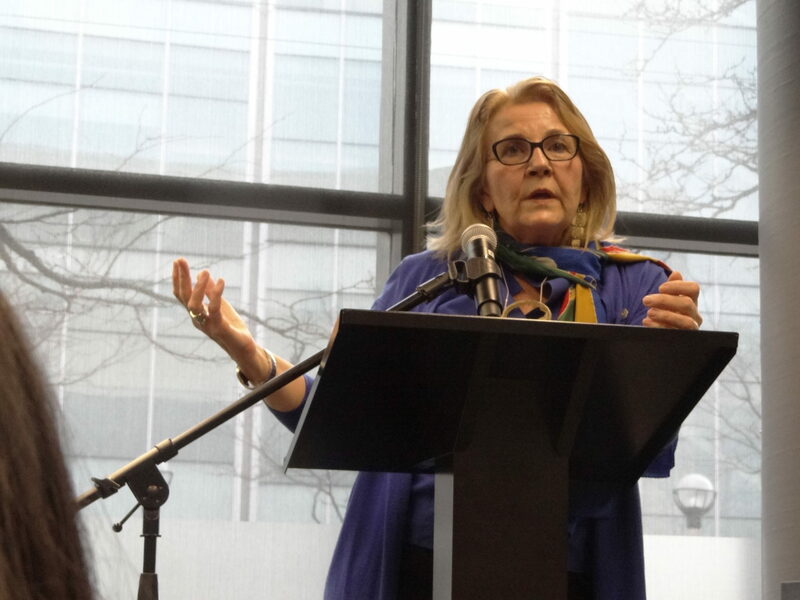 Journalists must embrace their role as educators when reporting on indigenous issues and recognize how their work shapes perceptions, Truth and Reconciliation Commissioner Marie Wilson said during this year’s Atkinson lecture at Ryerson’s School of Journalism. In her address, Wilson drew upon lessons she learned over many years as a CBC journalist and, more recently, the six and a half years she spent as one of three TRC commissioners. “Recognize the extraordinary value of the space you have been given – your column inches, your air time, your video frames, your Twitter characters, your hashtags,” she urged the journalism students, professors and professionals in the audience. The TRC investigated Canadian residential schools, which for more than a century, forcibly removed generations of aboriginal children from their communities. Established as part of the Indian Residential Schools Settlement Agreement, the TRC’s mandate was also to educate the public about the residential school system and help its survivors heal. The TRC heard from more than 6,750 witnesses and issued 94 calls to action, including three directly related to media and journalists. It called upon the federal government to restore and increase funding to the CBC/Radio-Canada so that it can reflect the diverse cultures, languages and perspectives of Aboriginal Peoples; it called upon the Aboriginal Peoples Television Network to support reconciliation; and it called upon Canadian journalism programs and media schools to make it mandatory for students to learn about aboriginal history. Wilson outlined a list of best practices for journalists covering indigenous people and issues. 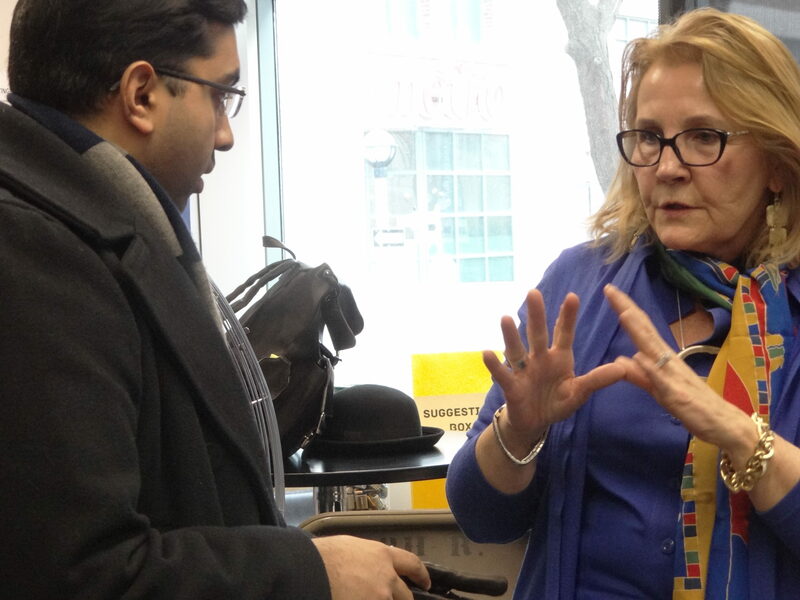 She said, for instance, that it is essential for journalists to recognize the significance of the residential schools when reporting on the victims, the survivors, the TRC or its calls to action. “Recognize the enormity of what happened in those schools and the question that helps people grasp the enormity: ‘what if it was my child? What if it was you?’” she said. It is also important to explain the process to people and how their words will be used, she added. Providing background and context for issues is necessary to tell a complete and accurate story, Wilson says. “Far too often we see, hear and read stories that start in the middle, move around in the middle and end in the middle. Context makes all the difference” when it comes to combatting the many misconceptions that surround issues affecting indigenous people, she said. Wilson said that listening patiently, despite deadlines, is essential to the practice of good journalism. “I assure you that if you can’t do that, you’ll miss the heart of the story,” she warned. As a commissioner, she said she worked to create a safe space for victims to tell their stories and urged journalists to do the same: “We had to listen with our hearts and we had to make it safe for people to speak from theirs. “All the adults and elders who came to speak to us, they were children when the things they told us about happened to them, [but] often they would even switch their verb tense from past to present: ‘I don’t want to be here. I want my mum and dad. I want to go home and I can’t go home. Why can’t they treat us with kindness instead of… [as]cattle,’” she recalled. Find positive stories in addition to the painful stories, Wilson said. Wilson says journalists reporting on indigenous issues need to understand the past to write about the present. “Know your history and if you don’t know it and have not been taught it… which is the case sadly for most Canadians in this country – learn it. Remedial learning is not bad learning,” she said. “At the end of the commission, we still didn’t have some of the basics right in the reporting about the commission,” Wilson said, pointing to an editorial published by the Globe and Mail days after the TRC released its calls to action. While the editorial was supportive of the commission’s report and urged the government to improve the conditions of Canada’s indigenous population, it also suggested then-prime minister Stephen Harper created the TRC. The media must hold governments accountable when it comes to their promises and look at past stories with a new lens of reconciliation, she added. “Go outside of your subject matter expertise, beyond your comfort zone… Give everyone a chance to speak, not just the noisy ones who are flapping their arms. Notice the quiet ones in the corners of our country,” Wilson said. Wilson’s presentation can be viewed here.